If you want to be good at anything in life it pays to use the best tools and equipment you can get. The words “budget” and “value” should not be on your radar when it comes to choosing the tools of your trade. That is why I bought a MacBook Pro for my writing even though I’d been a PC guy all my life — not because the MacBook is better particularly but because of the software solutions it provides for writers. I’d had the Ulysses app on my iPad for some time back from when I’d been playing around with using Markdown for writing instead of the awful Word. It looked gorgeous on the iPad and I was really impressed with it but at the time I was still PC only and there is a sad dearth of markdown editing software for Windows. That is slowly beginning to change but not fast enough. It was another reason for choosing a Mac. Ulysses for Mac is just as gorgeous as Ulysses for iPad. And guess what? They sync with each other. Silently and quickly. Without fuss or bother. It isn’t quite as slick as OneNote or Evernote but it is good enough. Once I started using Ulysses for Mac to write it soon began to dawn on me that it was far more of a tool for writers than just a markdown editor. Indeed, the more I poked around with it the more I realized that it offered most of the features I found useful in Scrivener. It is a content management system — you can organize your projects into folders and sub-folders to your heart’s content. For example, I have folders for blogs, poems and novels. Within the novel folder I have a folder for each novel or series of novels. Within those are folders for things like front matter, chapters, characters, locations, notes etc. You can add keywords to your documents such as “WIP”, “Published” or perhaps a character name. There’s a word count and statistics for selected text, document or any level of folders and subfolders. You can even set project goals with deadlines. I could go on at length about some of the wonderful little features lurking beneath the clean and tidy bonnet but I really want to draw your attention to the two features that turned Ulysses into my main writing software. They are both accessed via the little “Quick export” button on the tool bar. When writing a blog entry you can publish directly to your WordPress (or Medium) account. I can’t stress enough what a big deal this is if, like me, you find writing in WordPress utterly hateful, even more so since the introduction of their Gutenberg editor. 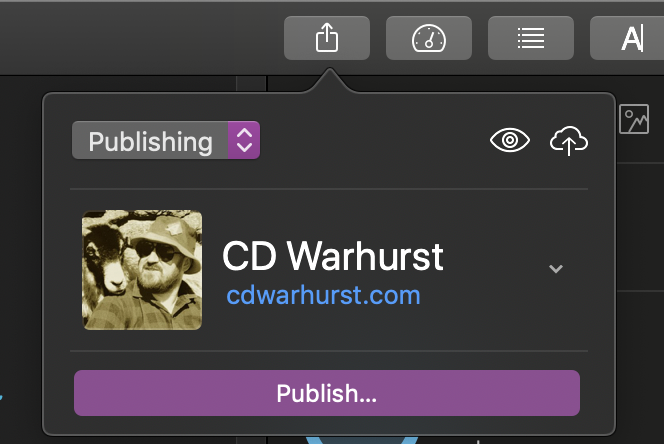 With Ulysses it is a joyous and simple experience — you select “Publishing” from the quick export menu, then click on “Publish”, add your tags and categories and go. Genius. And for those wondering, yes: Ulysses can handle images. At the risk of stating the obvious, this article was of course written and published in Ulysses. The second killer feature available from the quick export menu is ePub generation. If you are writing a book you can see how it will look at any time by selecting ePub from the quick export dropdown and hitting preview. Better still, you can choose to “open in…” iBooks and see how it looks in a professional eReader. This works particularly well as an editing system on an iPad. You can read through your book in Books and switch back to Ulysses to edit when you come across anything that needs changing. For me, it proved a game-changer. You can actually supply a cover image and create a finished ePub book with Ulysses though if novels are your living I would recommend exporting your book from Ulysses in DOCX format and importing in to Vellum to create the finished product. Vellum is not cheap but it is the best tool on the planet for producing polished eBooks. And in my opinion, Ulysses is the best tool for writing them.